Superman stands at the entrance of the Fortress of Solitude. 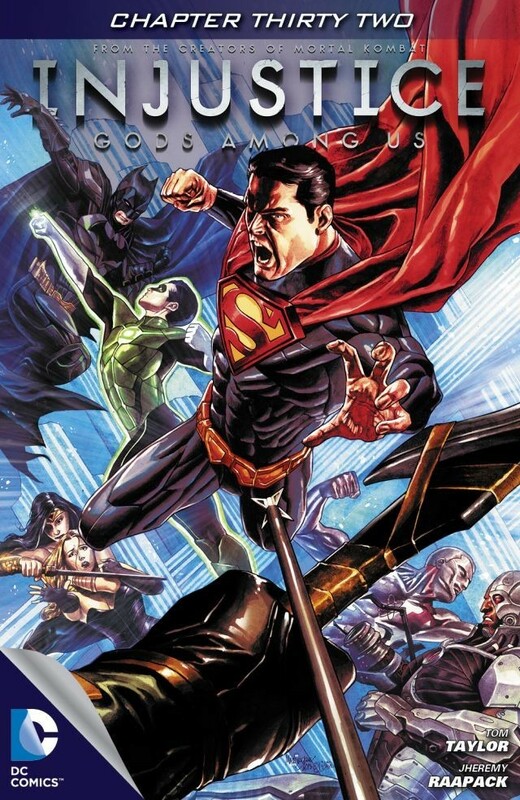 He stares down Batman and company, while Jon and Martha Kent reassure Superman that they are all right. Captain Atom regains consciousness and blasts Superman through the wall of the Fortress, causing a cave-in that separates Batman from Green Arrow and the Kents. Black Canary refuses to leave Green Arrow, but Batman informs them that he placed a locator on Arrow and they will get him out once Superman is gone. Captain Atom and Superman continue to battle, until Atom gains the upperhand and is about to deal the coup de grace, but Wonder Woman arrives and slits the neck of Atom's containment suit. Captain Atom decides to kill Superman with the explosion from his energy being released, and takes Superman to space to do the act. Wonder Woman follows, but is unable to stop Atom from detonating with the force of "more power than ten nuclear bombs". Story - 3: There is no word in the OED for disappointing surprise, and as such, there is no succinct way to describe the let-down that this issue was, after two good issues prior. Captain Atom regaining consciousness wasn't any particular failure per se, but that he comes at Superman with the indignant: "I gave you a chance to do the right thing," line is preposterous. Atom was going along to break into the Fortress, so what exactly is the right thing here? Superman should let them break in, steal his property and leave? The fight between Superman and Captain Atom is prosaic to say the least. Atom himself says: "So many different ways you can attack," reminding us that a fight between the two of them could and should be a feast for the eyes, but is all ways a boring fist fight because "...it feels good". Then, when Captain Atom has Superman at his mercy, Wonder Woman breaches Atom's containment suit, his Achilles' heel ever since Kingdom Come. If it's bad that we have to have time wasted with circuitous dialogue, it's worse that we cannot see the match between Atom and Superman conclude without interruption. The major failure is that by bringing Captain Atom back into the mix, after Superman has dispatched him, is that it allows Batman to escape, prolonging the inevitable scene that has to occur between Superman and Batman. It's a very cheap move, especially since Taylor seemed to be building up to something definitive, a Clash of Titans, rather than Batman running away and abandoning Green Arrow, who has become little more than Batman's comedy relief tool. Superman's actions here are a wee confounding as well. He has no problem with Atom initially, but can't get up to speed for round two. In the last scene, he's using his heat vision on Atom, which can only quicken the coming detonation. Either he's very confident that he can survive the blast, or it's an act of desperation that should erase his clear-headed portrayal of the last two issues. Why Wonder Woman is following is anyone's guess. She cannot survive a nuclear blast, and armed with a sword, there's little she can do but more of the same. Taylor continues his Injustice Two-Step, taking us back a step, and lowering the story in tandem. Hopefully next issue will restore the promise the series was starting to show and maintain. Art - 3: There's a nice shot of Superman on page 9, panel 3. He looks like a fallen angel of sorts. It's the best image in an otherwise standard collection of images and panels. Cover Art - 2: Is that supposed to be Kyle Rayner?